Mr. Turner, out now on iTunes and elsewhere, won’t be for everyone: M’damsel isn’t treated very well– artists are, you know, often narcissistic, driven users– but the landscapes thrill. We talk sometimes about going to the antique store in historical clothing and asking why our chattel is for sale. 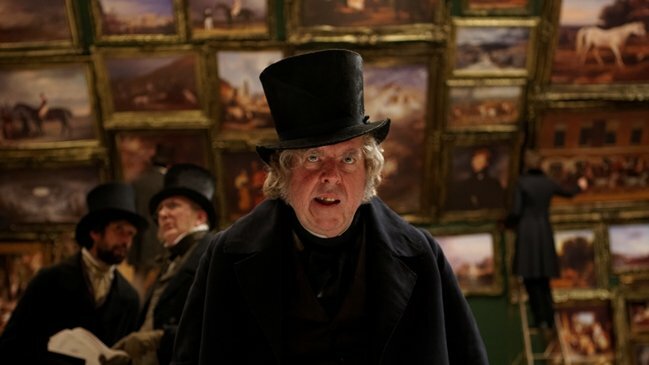 I toy with similar naughty thoughts about visiting historic house and other museums, but Mr Turner inspires a dream of a simpler pleasure: dressing in period clothes to visit a period gallery. No takers yet for this diversion, which is just as well. I expect it would be a quick way to meet security and police staff if you didn’t coordinate with the museum/gallery in advance. Still: what a stunt. Someday I’ll pull it off. That was new to me, and I love it. They even used pencil! I would love to do this, however the sailing ships no longer ply the route between from this colony. It would be a long journey, indeed, even if the ships still sailed! It is a shame, as I think we could have fun. It would indeed, and be perilous under sail. I look back at my forebears who sailed half way around the world – some by choice and some not – and wonder how they coped with the journey.